Banding is a packaging technique that is being adopted worldwide in a wide range of industries. Products are belted using Bandall equipment that is attached harmlessly with a paper or plastic film. In addition, as an option effectively marking tape can be printed to display graphic advertising and information - this is particularly popular in the food industry. Almost any product can be improved with a band to improve brand recognition and increase the shelf selection. No adhesives, shrink wrapping, labels, cardboard, excess materials. Perfect for all types of food products in clamshells, thermoformed trays, vacuum formed trays for ready to eat meals, fresh fruit, veggies, sliced meats, hot dogs and on and on. Click here to learn more about why you should choose banding as your packaging technique. Bandall banding machines are recognized worldwide as the most technically advanced banding machines available; featuring a patented system for transporting the banding material around the arch, delivering application accuracy. 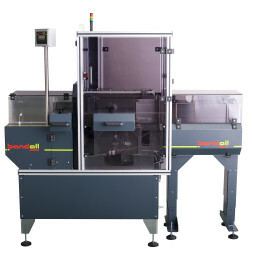 All Bandall machines work with a choice of band widths: 28mm, 40mm, 48mm, 60mm, 75mm and 100mm. Mobile, semi-automatic banding units, as well as custom made fully integrated in line solutions are available. We work together with you to determine full specifications and requirements. The TXL Series is designed especially for products that have a flat top and bottom surface. It's unique because it can be fitted with a choice of printers. This means that the machine can print in multiple positions on the band. 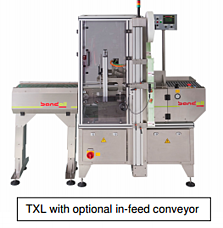 The TRL Series produces banding and bundling in a straight delivery and removal line. People working on the line of the machine make sure that the items being banded are place in the head of the machine accurately. This Series can be integrated with various types of delivery and removal systems. With extreme speed and accuracy, there's a quick turnaround time for your products. This series is a completely automatic Bandall machine. It's unique in the fact that it rotates the items being banded by 90 degrees. The product can then be packed and banded without any worry of damage. Motorized conveyor belts are used in this series to lower or higher the friction depending on the type of product that's being banded. One of the most common application of this Series is for trays because it makes stacking incredibly easy. It's also a cost-friendly banding option to use because it eliminates the need for taping, gluing and sealing. Banding is the bundle or labeling of one or more packages of a band of foil or paper. Bandall has succesfully provided these solutions for 25 years. Learn more about Bandall by clicking the image above.